B77 POWER ACE. 21/32" Top Width. 80 inches O.C. B77 BANDO POWER ACE. 21/32" (5/8") Top Width x 80" Length O.C. OEM 5L-800, OEM B077, OEM B77, AYP 5559H, AYP 55936, Gilson 200624, Lawn-Boy 705366, MTD 754-0112, Scag 48081, Toro 101140, Toro 101142. BX77 BX V-BELT, 15/16" Top width, 80 inch OC. 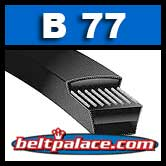 B76 BANDO POWER ACE V-BELT. OEM 5L-790, OEM B076, OEM B76, AYP 8100H. Jacobsen 011621, Jacobsen 311621, Kubota SB-76, MTD 754-0217.